Good morning! We’re just getting settled in for the first set of panels for the day. The talk will start in a couple of minutes. In the meantime: our speaker today, Danny Glenwright, is executive director of Journalists for Human Rights and a previous managing editor of Xtra newspaper. Glenwright: JHR is a Canadian media development organization based in Toronto, in operation for about 13 years. Glenwright: Started by Ben Peterson, who while on an internship in Ghana noticed a gap in what the media there, and the everyday issues he noticed on the street. Glenwright: Over the last few years JHR has worked in 23 countries, mostly in sub-Saharan Africa. They work with journalists who haven't had formal training. Glenwright: They also work with Aboriginal communities in Canada—the subject of today's talk. Glenwright: In many Northern or rural Aboriginal communities, journalists haven't had formal training. Or, non-Indigenous reporters who feel they don't have the tools to report stories on Indigenous Canadians responsibly. Their workshops and training programs are aimed at addressing this. Glenwright: One of the things I won't be doing today is assigning blame, pointing fingers or telling people how to do their jobs. The point of this presentation is to identify issues that might exist, and some possible solutions. Glenwright: We did a study when we first started looking into this issue—a lot of the stories we heard about the way that Canadian media represents Aboriginal communities was anecdotal. Glenwright: From 2011 to 2013 they conducted a study on this. A cumulative average of 0.028 per cent of stories published in Canadian media that time were about Aboriginal communities—it would be nice to at least see this closer to the over 2 per cent that is the actual population makeup of Canada. An elder once told me the only way an Indian would make it on the news if he or she were one of the 4Ds: drumming, dancing, drunk or dead. Those 4Ds sure do show up an awful lot. ">four topics that often see Aboriginal issues getting coverage: be a warrior, beat your drum, start dancing, get drunk. Glenwright: "Non-Indigenous people get to make their mistakes as individuals, not as an entire race." The media is often quick to report on transgressions, or financial issues with Chiefs, etc. Glenwright: Moving on to terminology. "It's just generally a good rule to ask people how they'd like to be identified." Genwright: Indigenous: represents First Nations, Inuit and Métis, and is also used internationally. Aboriginal: is best used as an adjective, not a noun. First Nations: Although it's widely used, no legal definition of it exist. Glenwright: Finally, the loaded term of Indian. It's best to avoid this whenever possible. There are, however, few instances where it might be appropriate: in constitutional or legal discussions, talking about status, in a proper name (Thunder Bay Indian Friendship Centre). 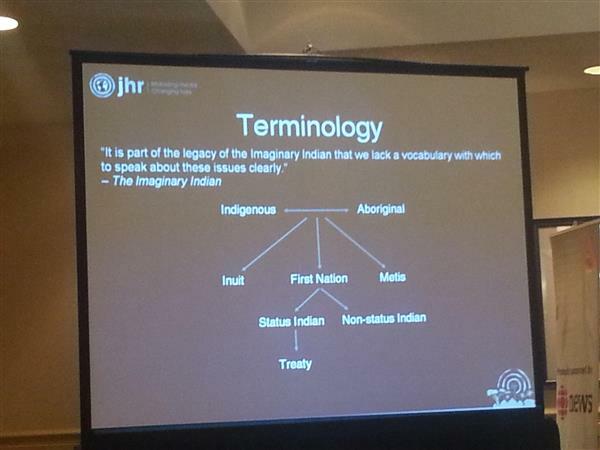 Glenwright: A good place for learning more about terminology, and where a lot of this material comes from, is McCue's online resource Reporting in Indigenous Communities. Glenwright: Terminology does change, and often newsrooms aren't up to speed. Glenwright gives an overview of treaty relations. 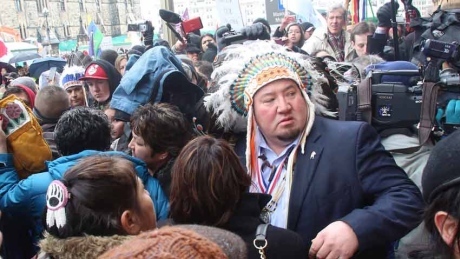 First Nations have a special relationship with the federal government because of these treaties—treaties that gives the federal government certain obligations to them. Describes the progression of treaty process as something that was initially a two-way street, and over time became a process imposed by the Crown. The Indian Act banned: cultural practices, gathering of three or more Aboriginal people in public, and many more severe oppressions. "It simultaneously stripped people of their cultural coping mechanisms." Notes that the Apartheid was modelled very much after what this structure looked like. Residential schools: the last one wasn't closed until 1996. By that time, more than 200,000 children had been forced into 132 federal institutions. In between this time was something called the "60s scoop", during which the federal government would place Indigenous children with non-Indigenous families as another form of cultural assimilation. Glenwright: Useful for the newsroom: come up with ways to incorporate this history into reporting on Aboriginal issues that calls for it. Sidebars of timelines, etc. Glenwright: Modern treaties have been made since the Indian Act. Most promises from these have not been fulfilled, and proving this is often difficult. It's first necessary to legally prove that treaties made orally or not fully documented are legally sound, which costs money. A good resource for learning more about the modern history of treaties is LandClaimsCoalition.ca. Moving on to financial structures: it's the federal government's responsibility to provide basic services to on-reserve First Nations. Federal funding, however, is not topped up, and municipal or provincial funding does not apply here. This also doesn't account for the fact that large swaths of Aboriginal communities live in urban areas. Tips for building relationships: You should be treating Indigenous communities as any other source on your beat, and call them just as often. Try to go to events, not just for the purpose of reporting on stories. Follow up with sources after a story you write is done. Check Aboriginal news sites. Look beyond cultural events for stories, and try to include Aboriginal people in stories with a non-Aboriginal focus. Journalists often only appear when a community is in one of two modes: crisis or celebration. That misses a whole spectrum of experience and complexity that can occur in between. Also: know the context of interviews. If you're interviewing with an Elder, for example, and they are telling you a story, don't rush them to get that quick recording or quote. Take the time to listen. Be upfront about who you are and the information you're looking for for a story—particularly when you're reporting on a sensitive issue. Also: useful to spend more time on solution-focused journalism. Not necessarily advocacy stories. For example: in the amount of reporting done on missing and murdered Indigenous women over the past year, stories on initiatives to bring attention to the issue, working for a solution, etc., are just as important as statistics. Being sensitive to issues is not the same thing as avoiding them. As journalists we have the responsibility to objectively report on stories, but there are ways we can do this while still being accurately sensitive to the issue of Indigenous reporting. As it happens, JHR and the Ontario Federation of Friendship Centres will be hosting a workshop on June 12 in Toronto about this very issue. Check out the J-Source story on it here.